The weather has finally changed, and it's been cold (wearing-scarves-cold) and rainy non stop. My fall-loving mind is very pleased! 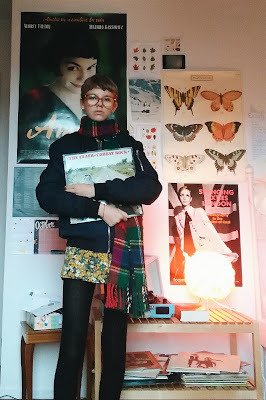 Today's outfit is inspired to all things mentioned above, and the inspiration post I did recently. It's not really special, and not amazing either, but it feels like an outfit someone on Carnaby street in 1967 would wear. Yeah, that's the look I'm going for today, ahem. THE CLASH RULES HELL YEAH. Honestly, if I knew what I was trying to do here I would love to tell you. 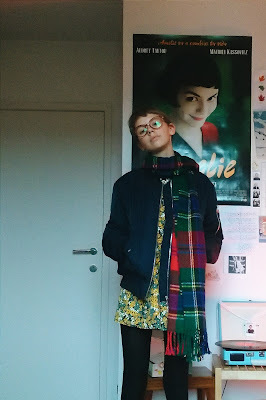 I got the scarf for 2 euros at a secondhand market, Light before Dark bomber jacket and random tights. The dress is from Zara, and although I don't shop there anymore, I still really like this dress! 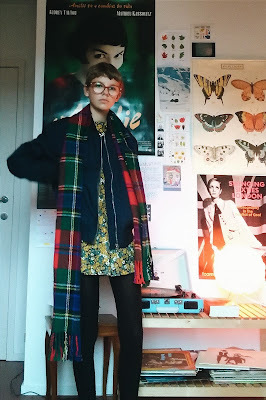 I bought it around this time last year (respect if you remember this post) it's perfectly mod, gives me Twiggy vibes and looks rad with this jacket. I made you a playlist as well! It goes with all my vibes recently and it's perfect for rainy Friday afternoons, or just any day, really. I hope you like it!